Proprietary Name: Eyeclear Pro What is the Proprietary Name? Non-Proprietary Name: Calc Carb, Calc Fluor, Causticum,cineraria, Euphrasia, Naphthalinum, Nat Mur, Phos, Quassia, Silicea What is the Non-Proprietary Name? 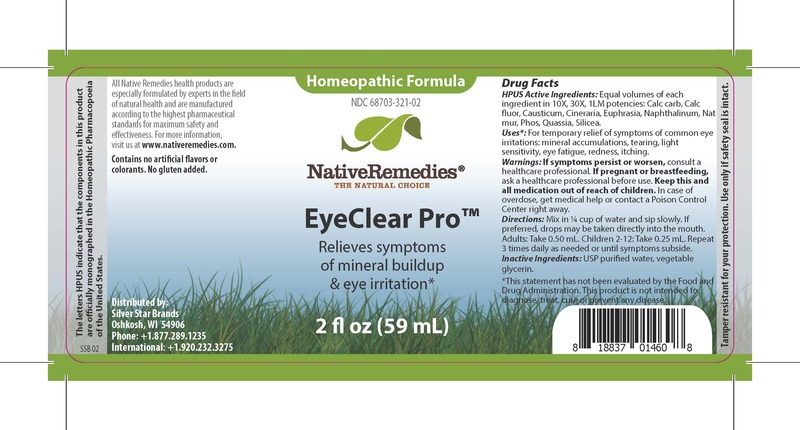 Eyeclear Pro with NDC 68703-321 is a a human over the counter drug product labeled by Silver Star Brands. The generic name of Eyeclear Pro is calc carb, calc fluor, causticum,cineraria, euphrasia, naphthalinum, nat mur, phos, quassia, silicea. The product's dosage form is liquid and is administered via oral form. HPUS Active Ingredients: Equal volumes of each ingredient in 10X, 30X, 1LM potencies: Calc carb, Calc fluor, Causticum, Cineraria, Euphrasia, Naphthalinum, Nat mur, Phos, Quassia, Silicea.The letters HPUS indicate that the components in this product are offically monographed in the Homeopathic Pharmacopoeia of the United States. Uses*: For temporary relief of symptoms of common eye irritations: mineral accumulations, tearing, light sensitivity, eye fatigue, redness, itching. *This statement has not been evaluated by the Food and Drug Administration. This product is not intended to diagnose, treat, cure, or prevent any disease. Directions: Mix in 1/4 cup of water and sip slowly. If preferred, drops may be taken directly into the mouth. Adults: Take 0.50 mL. Children 2-12: Take 0.25 mL. Repeat 3 times daily as needed or until symptoms subside. Relieves symptoms of mineral buildup & eye irritation.